Google announced they are launching datasets schema in the search results. We saw this coming as we reported the other month it is coming soon. The weird thing is this comes from something Google launched in 2016 named science datasets. In fact, it is the same help document with some added content. Now Google says "we identified an opportunity to improve how tabular data appears in Google Search and in doing so make it easier for all people to find the data they’re looking for. 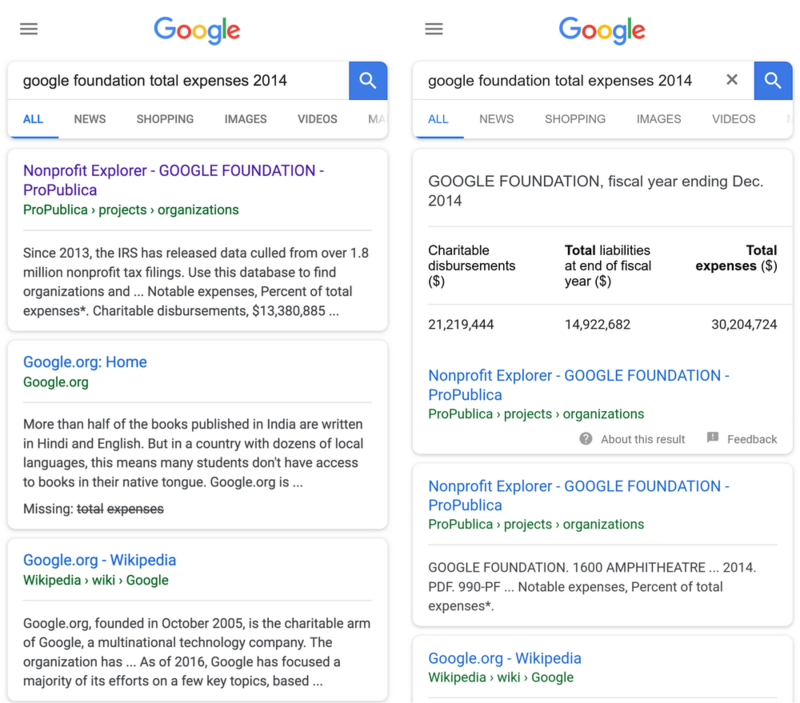 It works like this: news organizations that publish data in the form of tables can add additional structured data to make the dataset parts of the page easier to identify for use in relevant Search features." They even shared this screen shot of how it will look when it goes live, which I think is soon? The (somewhat laconic) example Google provides in this announcement is impressive: what surfaces from this ProPublica dataset isn't simply information about the dataset, but specific data points from that set that satisfy the searcher's query. All of this is consistent with Google's decade-long trend of expanding from being a provider of linked document descriptions to providing data directly from those documents (or more precisely, in this case, from linked resources described by a document). No appearance yet in the Search Features or Search Gallery pages, but I think it's fair to call this a new rich results type. While the announcement example closely resembles a featured snippet, featured snippets haven't to date been based on structured data: I wouldn't be surprised if we start to see the line blur between what are currently featured snippets and rich (and/or enriched) results.